Observation, Hardness and Streak Testing Kit. You will have hours of fun learning how to test the hardness and streak of eight minerals from the Mohs Hardness Scale. The included hand magnifier will allow you to see the details of each sample up close while you explore the world of minerals. 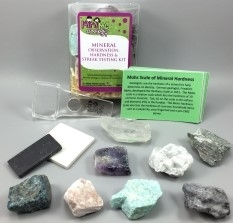 Information cards reveal details about each mineral sample and teach you how to test a mineral’s hardness, streak and how to focus the hand magnifier. Great for scouts, schools, home school and young rock hounds! Ages 6+.